The fun thing about having this ‘made on maui’ blog is I get to profile everyone from artists just starting out, to masters of craft. Larry Padilla, along with his four sons, are true Masters. Padilla Designs was started by Larry in the late 70’s when he moved to Maui as a metal sculptor. He started doing functional artwork in the early 80’s in the form of gates and railings. After having four boys, Padilla Designs evolved into a family business, as they were able to create larger and more elaborate functional metal sculpture. Padilla Designs now specializes in custom functional and decorative artwork, using a variety of materials including copper, brass, bronze, stainless steel and numerous hardwoods. You’ve probably seen their gates and other metal creations around the island, and if you attended TEDxMaui 2013, you saw their Mountain Backdrop on the MACC stage, as well as their eye-catching displays in the MACC amphitheater (more TEDxMaui photos at bottom). 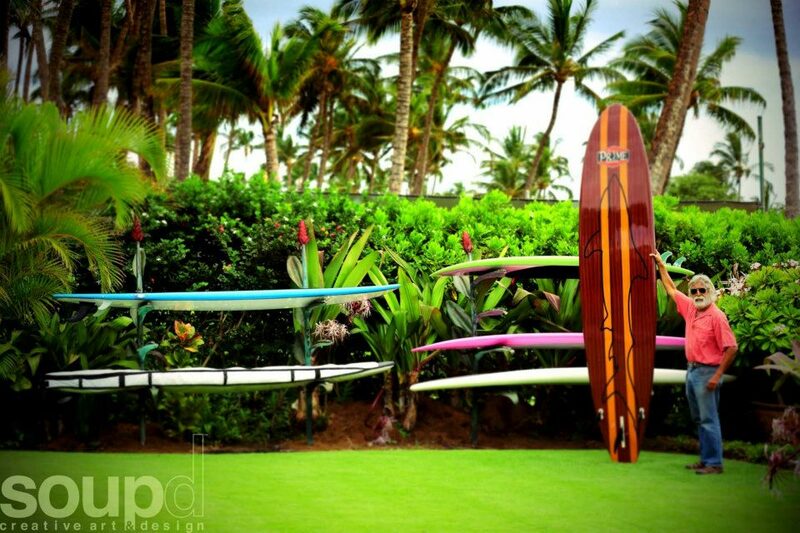 Maui Made: This is a true family business- how do you all get along working together? KP: My brothers and I have a very close family bond. We grew up fishing, diving and surfing together. Having that in common has helped us work together for common goals for the business. Working in a family business has its real perks. You can’t get fired but at the same time you can’t quit! We really have the flexibility to work hard and play hard while raising our families on Maui. I work with people I love and get to create pieces of art that will last for ever. MM: You were featured on HGTV- How did that happen? KP: HGTV contacted the family when we started doing our unique fire sculptures. I was in college at the time but they did a episode on our beautiful hawaiian flower tiki torches. It was cool to see us on national TV. I think everyone was a bit nervous for the whole production. Island boys with cameras in their face tend to be quite shy! MM: What’s the biggest project you’ve ever done? KP: Our larger projects we call Estate Metal Design. This is when we are hired to work with the designer, architect and owner to incorporate metal sculpture into the architecture of the property. For one property we did over one million dollars in metal sculpture in the form of railings, gates, fire, water and decorative sculpture. MM: What’s the key to a successful business on Maui? KP: Maui is a very small community and work of mouth is the best form of advertising. We have built our business on reputation and satisfied clients. If you do great work, have a great, honest attitude and do what you say, Maui will welcome you. MM: What’s the best part about working on Maui? KP: Working on Maui has so much to offer. Working in such a beautiful environment lowers the stress level. It’s hard not to take for granted but when I get stressed a quick dip in the ocean, trip to the river or run on the beach and i’m back to new. MM: Do you have designs on each island now? Where is the furthest Padilla Design? KP: Besides Maui, we have done work on Oahu and Kauai. We’ve designed for clients all over California, and even as far as New York. We currently have some interest from a client in Japan. MM: What’s next for Padilla Designs? Creating the patina for Jim Nabor’s gate.